Far too many parents face an ongoing struggle to get their kids to eat well, so why is it that French children gladly wolf down all the things our kids hate – the dreaded spinach or broccoli, fish, olives, salad…? 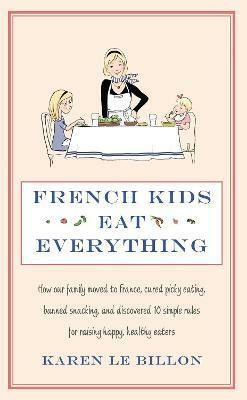 In French Kids Eat Everything, Karen Le Billon shares her experience of moving to France and finding the inspiration to transform her family’s approach to eating. If you’ve ever tried hiding healthy foods in your kids’ meals, bribing them to finish – or even start – something healthy, or simply given up in exasperation at your child’s extensive list of banned foods, this book will strike a chord. It charts the author’s enlightening journey from stressed mum of picky eaters, to proud – if somewhat surprised – parent of healthy, happy eaters. Along the way, you’ll discover the ‘food rules’ that help the French foster healthy eating habits, why it’s vital to get kids to try the same food many times over, the value of educating your children about food from an early age, why how you eat is just as important as what you eat – and much, much more. With tips, tricks, rules and routines for happy, healthy eaters – plus some fast, tasty recipes to try – this isn’t just another tale of Gallic gastronomic superiority but a practical guide to instilling in your kids healthy eating habits that will last them a lifetime (and ensure less stressful mealtimes for you too! ).